The name of Reinhard Keiser is closely connected to the Oper am Gänsemarkt in Hamburg. This was the first opera house in Germany which was not part of an aristocratic court; every citizen could buy a ticket. The librettos were mostly in German, although often the arias were in Italian or French. It opened in 1678 with a performance of a sacred opera by Johann Theile. Many composers who are still well-known were active in Hamburg as opera composers, such as Johann Philipp Krieger, Johann Mattheson, Christoph Graupner, Georg Philipp Telemann, George Frideric Handel and Reinhard Keiser. However, the repertoire of the Oper am Gänsemarkt is comparatively obscure. One reason is that a large part of it has been lost. Telemann's oeuvre continues to enjoy increasing interest and some of his operas have been performed and recorded. However, most of his operas are lost or have been preserved in only fragmentary form. From Graupner's operatic output almost nothing has survived. In the case of Keiser the situation is much better. His colleague Johann Mattheson stated that he had composed over one hundred operas. That is certainly highly exaggerated, but there is documentary evidence of at least 66 operas from his pen. Less than a third has survived: 19 largely complete scores and substantial fragments of others. However, very little of his output has received any attention in modern times. Very few of his operas are available on disc, and because of that this reissue should be welcome. That said, I am not sure whether this particular issue will do Keiser's reputation any good. The fact that he was so prolific works against him. It hasn't exactly given him a good name among music historians. Telemann also suffered the same fate but more of his oeuvre has been explored. As this has happened so the conviction has grown that most of it is of very good quality. Whether the same is the case with Keiser is hard to say. 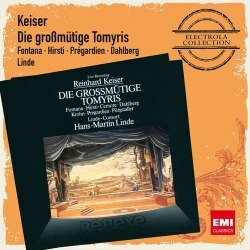 This recording of his opera Die großmütige Tomyris is probably not such a good argument for his case. It is claimed that this live performance of 1988 represents the complete opera. That seems to be incorrect: the track-list includes the numbers in the libretto, and some are omitted. In the first act we hear numbers 1 to 5, 7 and 8 and then 10 to 14. This indicates that parts have been cut. Whether that is because those parts have been lost is impossible to say; the liner-notes omit any information about that. The work-list in New Grove doesn't indicate that this opera is incomplete. This is a recording of a staged performance which explains the stage noises. I find that rather annoying if there is nothing to see. German speakers may understand large parts of the recitatives, but even they will miss some words or lines. The booklet is no help on that front as a libretto is omitted. It is also questionable whether those who don't understand German are willing to listen to long episodes with recitatives - some more than five minutes - without understanding what they are about. I must add that the singing is hardly a reason to purchase this disc. Most of the soloists sing with a pretty big wobble, especially Gabriele Fontana who takes the title-role. Marianne Hirsti and Oskar Pürgstaller are stylistically more convincing. Christoph Prégardien is the best of them all, but I have never considered him a real opera singer. He doesn't convince me here either. From a dramatic point of view he is rather stiff, and that goes for the most of the cast. Despite this being a live performance there is no real drama or impulse. The Linde-Consort has never been a very engaging ensemble, and their playing is too straightforward and not very imaginative. As much as I would like to see operas by Reinhard Keiser being recorded, this recording should not have been reissued. It is time that his operas were carefully examined, performed and recorded. It seems that this particular example includes a lot of good stuff, but, sad to say, that is not conveyed here.